As hard as it is to get a ticket to the GRAMMYs, the only ticket that’s tougher is the one to the pre-GRAMMY party hosted every year by legendary music man Clive Davis. But this year, we were given unprecedented, exclusive access to the Beverly Hills bash with American Idol winner Jordin Sparks. 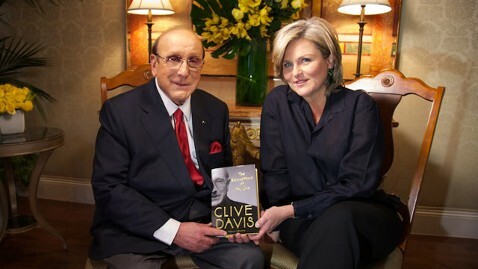 ABC's NIGHTLINE to Air, Advance article "Clive Davis Tells All in New Memoir"
Clive Davis is a force of nature. Not only did he discover talent as wide-ranging as Janis Joplin, Santana, Whitney Houston and Alicia Keys, he has recorded everyone from Bob Dylan and Bruce Springsteen to Dionne Warwick and Aretha Franklin. There were the Grateful Dead and Aerosmith. Did I mention, Barry Manilow, Jennifer Hudson and Kelly Clarkson? He formed a company with L.A. Reid and Babyface, which became home base for Usher and Pink. With Sean “Puffy” Combs he founded Bad Boy Records and recorded Notorious B.I.G. The list does go on and on. Tickets to "An Intimate Conversation With Clive Davis"
Tickets to “An Intimate Conversation With Clive Davis” on February 21st INCLUDE a signed copy of Mr. Davis’ book “The Soundtrack of My Life”!! Presented by New York University’s NYU-Clive Davis Institute of Recorded Music & Tisch School of the Arts.